Isabeli Fontana shares more pics of her sheer wedding dress | HELLO! Isabeli Fontana wowed fans when she tied the knot in a completely sheer wedding dress. The 33-year-old rocked the transparent bridal gown by Brazilian label Agua de Coco over a white bikini as she wed singer Diego Ferrero in the Maldives. And now, the Victoria's Secret model has shared more pics of the risqué bridal look on her Instagram account. She posted a snap of the newlyweds kissing, while another showed the dress and its beautiful embroidered detailing from behind. Last week, the couple shared images from their big day with their fans. The snaps included the pair doing a high-five while standing on a jetty, with a rainbow overhead. 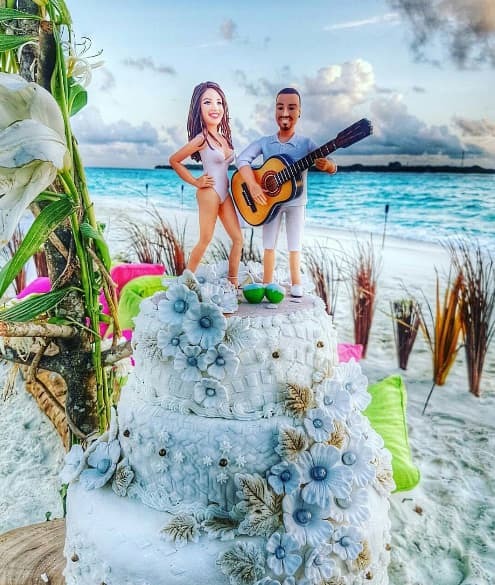 They also showed off their wedding cake, a beautiful white and pale blue floral creation with an adorable cake topper that showed Isabeli posing in a bikini while Diego plays the guitar. You can see their beautiful wedding invite, surrounded by a message bottle and seashells. Although Fontana is missing the Olympics in her home country, she told WWD recently that she thinks South American women make the most successful models as they "are very exotic and naturally beautiful". "We have a good mix of cultures and a healthy mix of people and races,” she explained. "The girls here are very exotic and naturally beautiful at the same time, so I think that's why Brazil has a big scene of good models." You HAVE to see Isabeli Fontana's sheer wedding dress!